Itâ€™s commonly known that Blu-ray burner drives and media are considerably more expensive compared to itâ€™s standard CD/DVD counterparts. Recently, some insights have been shown on Taiwan TV talk shows on how Taiwan will help worldwide consumers reduce this cost barrier issue for Blu-ray. Taiwan manufacturers of Blu-Ray media have put in long-term investment and patent funds for BD-RE approx. 8 years ago. With more than 20 years experience in 3C, Taiwanâ€™s market entrance will definitely lower the BD-RE media pricing. A major reason for the lowered costs from Taiwanese manufacturer is because they already own the world patented â€œAuto-Balanceâ€, Laser Head and Loader and have each obtained laboratory grade certification for 4x BD-R SL and 2x BD-RE SL formats. The only preventative factors until now, is that they had not invested in the equipment necessary for the massive production of BD media. The primary obstacle in the pricing of Blu-ray media is the â€œRoyaltyâ€ fees that media manufacturers have to pay for the right to produce it. That occupies 1/10 of the Blu-Ray price. Shanghai United Optical Disc has completed the establishment of its first production line for CBHD (China Blue High-definition Disc), China’s self-developed high-definition optical disc format. Royalty fees to produce licensed CBHD players will be about US$8.10, much lower than BD licensing rates, the industry sources in Taiwan indicated. CBHD has not won support from leading movie studios in Hollywood and this is expected to render the format at a significant disadvantage in competition with BD, the sources pointed out. Although there is a keen interest in HD content at the moment, big volume shipments are still a long way off. Makers agree that there is not much potential of mass production until they see support from solution providers, especially from chipmakers and design houses in Taiwan. So when the major Taiwanese media manufacturers cut in, weâ€™ll see significant reductions in Blu-ray media pricing which will carry over to all aspects of the Blu-ray format. With the adoption of the HD capability of Blu-ray, new industries will pop up as off shoots from this new technology. An example of this is a new make-up line meant to reduce the exposure of imperfections on the human face that the HD cameras will pick up with greater resolution. 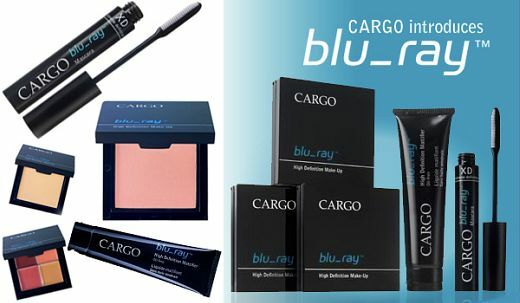 Cosmetics Company, Cargo, recently debut a new Blu_ray make-up line specifically for hiding physical imperfections on high-def video shoots. No, not quite smooth enough yet!? The Middle East is a blossoming market with tremendous potential and growth in the CE field. Itâ€™s for that reason that Vinpower attended the 2008 Gitex trade show in Dubai, U.A.E October 19 ~ 23. 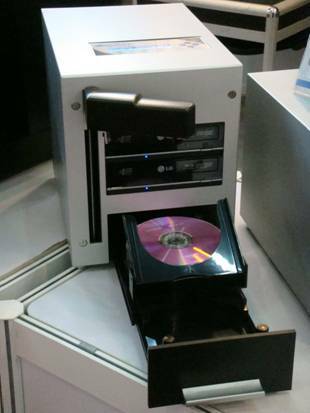 We were located in Hall 3, booth number 332, displaying various standalone optical disc duplication products. We showed our new SATA controllers, Daisy-Chain towers, SharkCopier duplicators with LightScribe capabilities, new autoloader series like the Cube1 & 2, the market leading Xerox duplicators, CD/DVD cover printers, and so on. Dubai’s GITEX is the largest consumer electronics exhibition of its kind in the Middle East giving it great prominence in the region. Vinpower had their eyes set on the Dubai market for many years and this is the fifth year that Vinpower has participated in the show. By providing high-end solution in duplication market, Vinpower has been regarded as the best quality manufacturer in the market. After a successful Gitex, Vinpower plans to introduce more products in the near future. For the 4th year in a row, Vinpower Digital exhibited its latest line of duplicator products at the 104th China Canton fair. 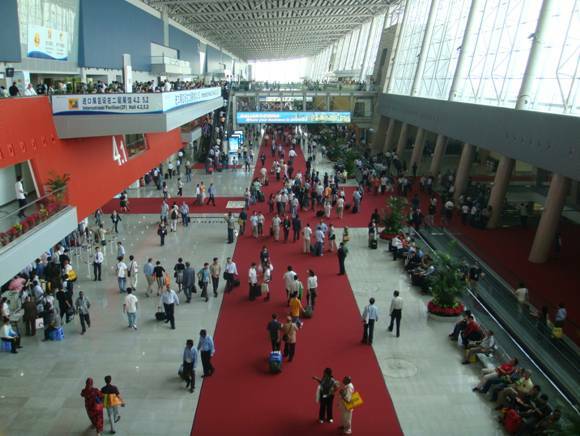 Itâ€™s one of the most important exhibitions in China which attracts hundreds of thousands of visitors through the duration of the show. Through greater exposure from the Canton province news media interview at Vinpower Digitalâ€™s booth, more international visitors can obtain information about these new â€œgadgetsâ€ for new BD opportunity in the Chinese market. Vinpower Digital caught a lot of peopleâ€™s eyes while exhibiting in the consumer electronics product hall with our unique and impressive products. Take the SharkCopier Daisy Chain units for example, which can link several towers together which can produce a large amount of copied discs from a single master. Also, the Titan and Cube autoloader series with Blu-ray drives was a big head turner and is the best solution in the future for optical storage. These units garnered a lot of attention because in July, the Blu-ray Disc Association and CESI Technology announced the establishment of China’s first Blu-ray Disc Testing Center. The first China-made Blu-ray music video disc, Ai Tu Lan, was released in April, 2008. The center will test BD-ROM movie players from Chinese manufacturers and provide data to the BDA. This will shorten the lead time for product development and market launch of fully compliant BD products for Blu-ray Disc product manufacturers. The more popular the BD market is, we believe the price will become more acceptable for common consumers and will raise up the entire market for BD duplication equipment.